One of the difficulties encountered in studying wave motion is the rapidity of the propagation of the waves. A fairly moderate speed is attained by the waves propagated along a spiral spring. 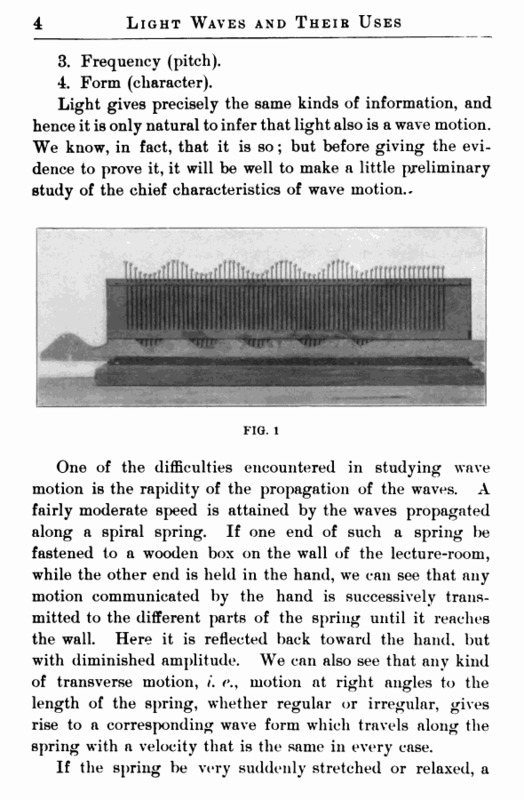 If one end of such a spring be fastened to a wooden box on the wall of the lecture-room, while the other end is held in the hand, we can see that any motion communicated by the hand is successively transmitted to the different parts of the spring until it reaches the wall. Here it is reflected back toward the hand, but with diminished amplitude. We can also see that any kind of transverse motion, /. f\, motion at right angles to the length of the spring, whether regular or irregular, gives rise to a corresponding wave form which travels along the spring with a velocity that is the same in every case. chanical models imitate wave motions rather than produce them. They are purely kinematic illustrations, and not true wave motions; for in the latter the propagation is determined by the forces and inertias which exist within the system of particles through which the wave is moving. 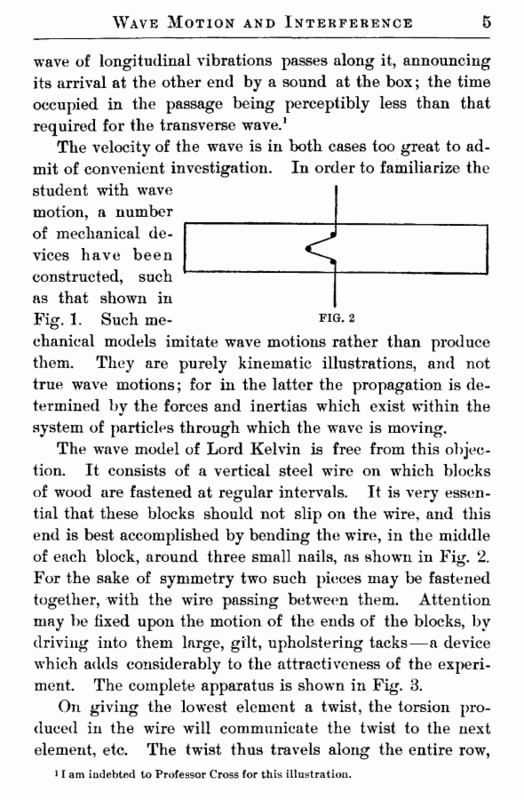 The wave model of Lord Kelvin is free from this objection. It consists of a vertical steel wire on which blocks of wood are fastened at regular intervals. It is very essential that these blocks should not slip on the wire, and this end is best accomplished by bending the wire, in the middle of each block, around three small nails, as shown in Fig. 2. For the sake of symmetry two such pieces may be fastened together, with the wire passing between them. Attention may be fixed upon the motion of the ends of the blocks, by driving into them large, gilt, upholstering tacks—a device which adds considerably to the attractiveness of the experiment. The complete apparatus is shown in Fig. 3.
i1 am indebted to Professor Cross for this illustration.